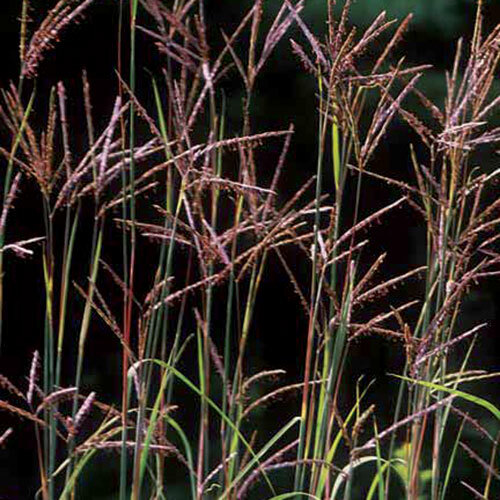 (Andropogon gerardii) The monarch of the prairie, largely responsible for the formation of the famous prairie sod. Once covered thousands of square miles of the tallgrass prairie from the Atlantic Ocean to the Rocky Mountains. Lush green 3-8' plants change color at first frost to an attractive reddish-copper that lasts well into the winter. Thrives in almost any soil. Perennial. Hardy to zone 3. Instructions - Sow seeds indoors in a warm area (70-85°F). Transplant outdoors after danger of frost has passed. Seeds can also be directly sown into a weed-free seedbed in late April-June. Tolerates most moisture levels and withstands drought.